Anywhere you want to...around the neighborhood, on a treadmill, in the mall...anywhere you can fit in 3.1 miles (5K) before you dive into those wings during the game! Grab your friends, family members, neighbors, kids, dogs, etc. and join fellow football fans from around the country for some exercise on Superbowl Sunday morning! 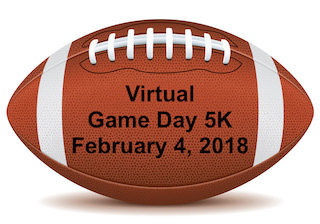 During registration, select the football team you want to represent on the run or walk, proudly wear your team colors, and the team with the most registrants will be declared Game Day Champions on our Game Day 5K facebook page at 6 pm (EST) on Superbowl Sunday! Each person who registers before 5 pm on February 4, 2018 receives a soft, comfy "THIS IS MY GAME DAY SHIRT" short-sleeved tee. Members of the winning Game Day Championship team also receive an award medal that doubles as a bottle opener. Shirts and medals will be mailed within 15 business days of the event.